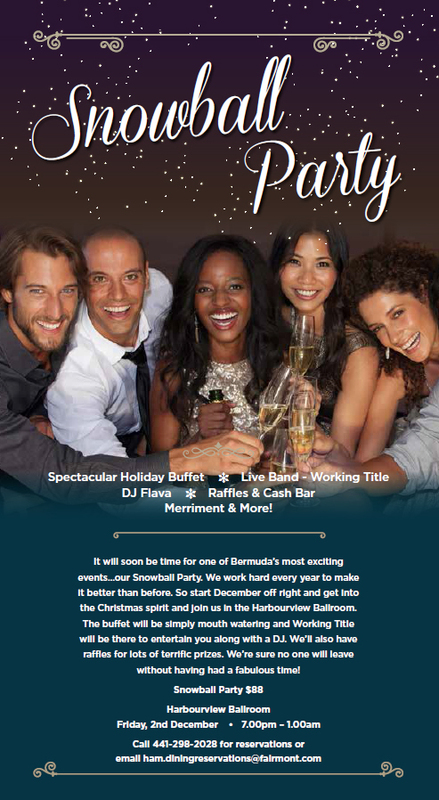 Hamilton Princess & Beach Club will host its annual Snowball Party on Friday, December 2 from 7pm until 1am in the Harbourview Ballroom. The Snowball Party is a big event designed for small and medium-sized businesses who wish to celebrate the holiday season with their employees in a big-party atmosphere. The holiday party includes a buffet dinner, raffle prizes and cash bar. Live entertainment will be provided by DJ Flava and live band Working Title. “Christmas parties are a great occasion to spread cheer and merriment with friends and colleagues,” said Allan Federer, general manager, Hamilton Princess & Beach Club. The Snowball Party is $88 per person and a special Elevator Home rate of $199, excluding gratuities, is available for any guest who wishes to spend the night at the hotel. For reservations, call 298-2028 or email ham.diningreservations@fairmont.com.